Independent reading is so important to my reading program and it's one of my favorite times of the day! I love seeing my students so engrossed in their books, begging me for just five more minutes of reading time. This time builds fluency, vocabulary, background knowledge, and better writers. Although this time is for my students to choose books of their interests and personal choice, I do want them to select good literature that challenges them. I try to steer them in this direction during conferences if I see a repeated pattern of selecting "easy" or "too hard" of books. They set goals and pace themselves to complete their books with my frequent "check-ins" during the week. 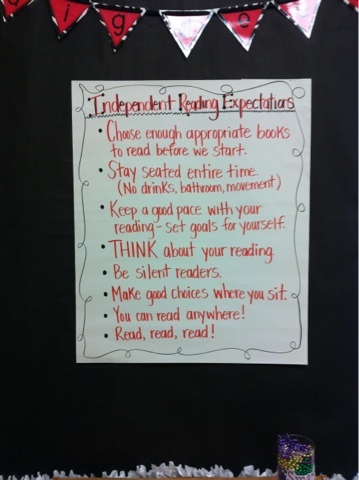 My students have independent reading for about 20 minutes every day. We have a school wide reading time for 30 minutes on Fridays (I get to read too!) 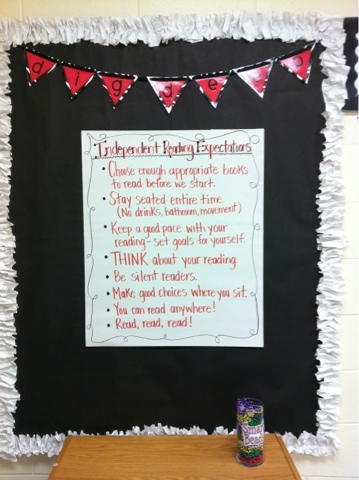 Students need to see their teachers as readers. I take turns sitting in different sections of the room and sitting with different students. I share my thoughts about the books I'm reading and the highlighting I do to professional books. Books should be loved and I want them to see my "thinking" while I read! I share this research (below) at Open House to help the parents understand the importance of reading at home and outside of the reading block.These statistics are eye-opening to parents. Leave a comment, I'd love to hear about your independent reading! We are only 2 days in to the start of school and my 4th-sters are eager to read all day long! Thanks for posting this great chart. I plan on using the idea for my own classroom. Do you have a source for your research? I'd love to share it with my students, and was wondering where it came from. Independent reading is good way for student and this article tell me how to study without any help thanks for share it hire someone to write a paper .